That time has gone when you needed a fax machine to send and receive fax. Now you can send fax with just an Android Smartphone. It really sounds great as no one want to purchase those expensive and large fax machines when there is a smarter, cheaper and convenient way available. Who could imagine that we'll be able to fax our documents with the help of a phone and Internet connection. But this era is of smartness. New technologies are keep on evolving and this is one of them. Fax stands for facsimile or sometime telecopying or telefax. As you already know it's mainly used to send and receive scanned printed documents that can contain both text and image. Both side fax machines are connected to output device such as printer. There are a couple of free fax apps available in the play store which claim to send and receive fax and the only thing needed by them is active Internet connection. That's it, you're done. No need to spend a single penny on those King Kong size fax machines. One can send photos, screen shots and pdf files too to any traditional fax machine. You just need fax number then just attach files and hit the send button. 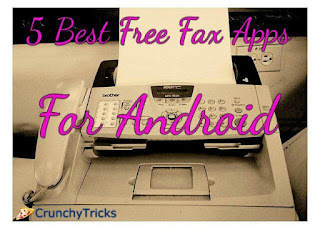 But frankly saying I didn't find many free fax apps for android. If they are free to download then require in-app purchases. You'll have to pay if you want to use all the services mentioned in the app. 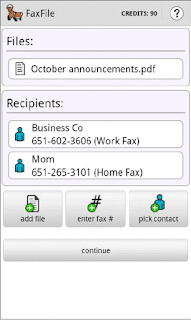 We've covered some of the best fax apps (both free and paid) here to send fax from cell phone. You can check them out below. 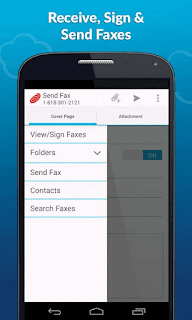 FaxFile top rated fax app in our list also in the play store. This app is stands on first place with the highest rating of 4.3 out of 5. This is only because of its user-friendly and simple to use interface. If you're looking for best results then just go for it. You can send fax to any number in many international countries such as USA/Canada. One can easily send PDF documents, Microsoft documents (.doc or .docx), images (PNG and JPG) enabling you to transfer in the background. Don't worry it will provide you a continuous status in the notification bar. It's required to purchase credits to send a fax. Fax credits are not refundable. Check international rate before purchasing credits. In case fax fails to send then make sure that the fax machine is working by making a call to it. It takes at least 3 minutes per page to transfer and 2 minutes to fax if you're sending image documents. 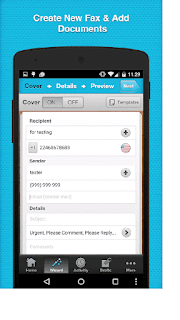 Note: - To add custom cover to your faxes use their app FaxCover. Another app in our list to fax documents is eFax. This app lets you send, sign and receive faxes. Once you install and sign in into the app as a new user it will allot you a personal fax number with limited number of free features. One can easily scan and fax document. 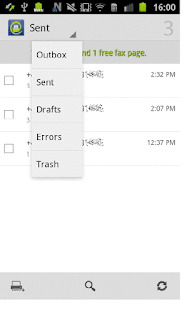 eFax allows you to upload files either directly from your mobile or from email, cloud storage. Not only this app enable you to edit your documents with a single click only. You can even sign on screen using your finger to create an electronic signature. Note: - You can customize your fax with custom cover through this app. I would suggest Genius Fax only because it's available for most of the countries. 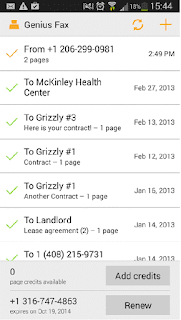 To send a fax simply choose a file from your device, Dropbox, Google drive or any other app. Their receiving option is also user-friendly. Subscribe a fax number and start receiving faxes. Currently their services are available for US, Canada, UK, Japan, France, Germany, Argentina, Brazil, Israel, India, Portugal, Italy, Hong Kong, Puerto Rico and Australia. But soon they will make it available for more. Cover page doesn't cost credit. You can subscribe to a fax number for 1, 3 or 6 month. It will cost you around $3.49. Additional months can be added any time. Push notifications for success and failure. Note: - Genius Fax is fully compatible with Genius Scan. You can scan documents with Genius Scan and fax them with Genius Fax. Genius Fax supports documents up to 20 MB. PC-Fax is the only app on Play Store which allows you to send a single fax for free to 50 countries worldwide such as USA/Canada, Australia, China, Hong Kong, Russia, Japan and most European countries. This app enables you to use its features without any registration. Free for one fax per day, to send more purchase credits at a bargain price. Convert photo into PDF document without any cost. Upload documents directly from your browser. Last but not the least iFax is another option for you. I would suggest this app only if you're not able to send or receive fax from any of the above mentioned apps. As won't get good reviews about it. Users are facing issue while sending faxes. You can easily get your own local or toll-free fax number in the US, Canada, UK and many other countries. One can attach images from photo library or using camera and crop and adjust brightness, sharpness etc to optimize images for faxing. As darken photos won't seem clearly in fax so you can make them bright using ready-made tools. Secure & private faxing using HIPAA-compliant, enterprise-grade fax technology. Get real-time notifications related to fax success or failure. Dedicated fax number starts at just $27.99 per month.